slmag.net 63 Clockwise from top left: An icon since it was released in 1950, the Polaris Memovox has been the source of a long line of Jaeger-LeCoultre mechanical watches equipped with an alarm. A 1968 model inspired the latest release, which is being issued in a limited edition of 1,000 pieces ($12,600; jaeger-lecoultre.com). TAGHeuer Carbon Aquaracer with a 41mm black PVD-covered titanium case that houses the carbon bezel. 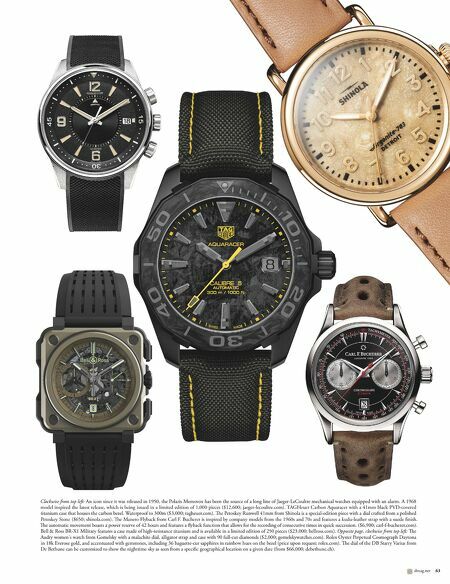 Waterproof to 300m ($3,000; tagheuer.com). e Petoskey Runwell 41mm from Shinola is a special-edition piece with a dial crafted from a polished Petoskey Stone ($650; shinola.com). e Manero Flyback from Carl F. Bucherer is inspired by company models from the 1960s and 70s and features a kudu-leather strap with a suede finish. e automatic movement boasts a power reserve of 42 hours and features a flyback function that allows for the recording of consecutive times in quick succession. ($6,900; carl-f-bucherer.com). Bell & Ross BR-X1 Military features a case made of high-resistance titanium and is available in a limited edition of 250 pieces ($23,000; bellross.com). 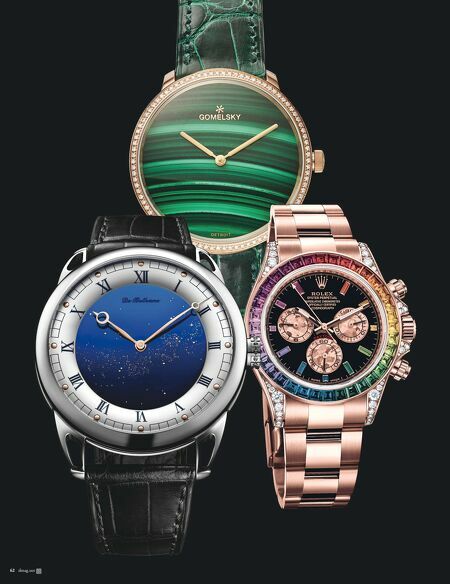 Opposite page, clockwise from top left: e Audry women's watch from Gomelsky with a malachite dial, alligator strap and case with 90 full-cut diamonds ($2,000; gomelskywatches.com). Rolex Oyster Perpetual Cosmograph Daytona in 18k Everose gold, and accentuated with gemstones, including 36 baguette-cut sapphires in rainbow hues on the bezel (price upon request; rolex.com). e dial of the DB Starry Varius from De Bethune can be customized to show the nighttime sky as seen from a specific geographical location on a given date (from $66,000; debethune.ch).